AboutFace Bagladies Ethel and Shirl. Photograph by Rod Johnston. Based in Melbourne, AboutFace Productions is the vehicle for the creative endeavours of award-winning puppeteers Annie Forbes and Tim Denton who are well known for making idiosyncratic and transformative small-scale shows exploring human experience and universal themes. ‘A sublime and extremely powerful show’. 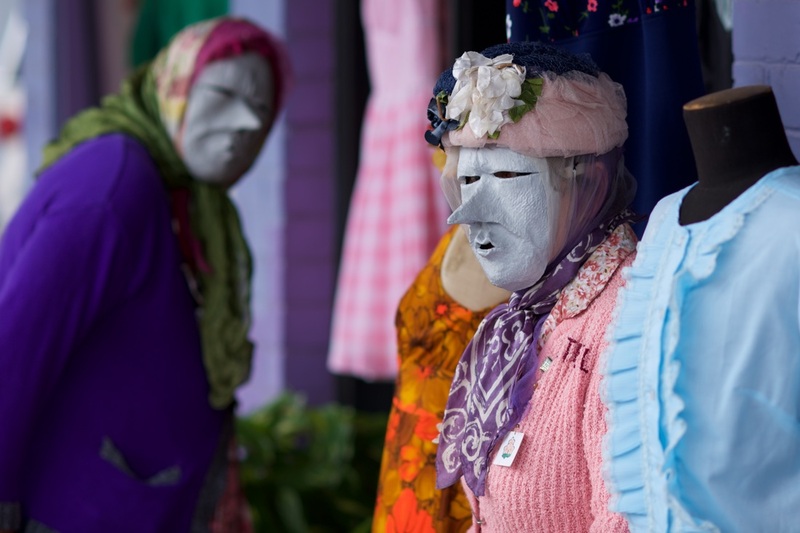 Highly regarded throughout Australia and New Zealand for their inventive work, AboutFace continues to be in demand to create puppets that push the boundaries of puppet design. Tim and Annie created all the puppets, masks and animated imagery for The Flying Fruit Fly Circus production The Promise, presented by the Sydney Festival, which won the 2009 Helpmann Award for Best Presentation for Children. Recent notable commissions have been for the Australian Ballet La Bayadere; Sydney Theatre Company Storm Boy; and LemonyS Productions Picasso & His Dog. In 2014 Paper Shaper designed by Tim Denton and co-devised with L. Peter Wilson won the UNIMA Award: Best Drama by a Foreign Company at the 1st Asia-Pacific International Puppetry Festival in Nanchong, China. Annie Forbes and Tim Denton also continue to make an important contribution to puppetry education, teaching workshops and masterclasses for the Victorian College of the Arts and The Arts Centre Melbourne as well as providing ongoing mentorships with emerging puppeteers.